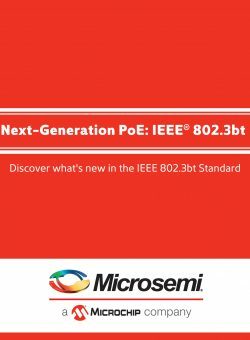 Since the ratification of the first PoE standard in 2003, PoE use has increased dramatically and made headway into new applications. POE provides huge benefits in relation to ease of installation, Saving CAPEX and OPEX costs, and providing a unified and safe power standard for worldwide use. The main limiting factor affecting PoE use in new applications is the amount of available power. While 15.4W at the power source is sufficient for most IP phones and 802.11a/b/g access points, it is not enough for IP video phones, 802.11n, and pan-tilt-zoom (PTZ) IP cameras. For that reason, the Institute of Electrical and Electronic engineers, or IEEE, released IEEE 802.3at in 2009, specifying 30W at the PoE source. today there is a demand for even higher power to support additional devices connected to the Ethernet network.